Luke appeared 3 weeks early.....so healthy and beautiful. Jumped up and sucked on mom! A perfect package, gorgeous. One sad morning Jon (my husband, an equine vet) saw him standing at the water tank with his eye dripping out of its socket. He laid him down, gently put all back in place, and sutured his cornea. We trailered him and his mother to Dr. Latimer in Kentucky, who performed an amazing surgery on him. We were able to preserve the eye but no sight. Luke is fully healed, not at all hindered by his loss of sight, and is staying home with us. We love him. As a yearling Hilda Gurney (dressage judge) commented: "Lovely hip, nice feet, beautiful big rhythmic walk!" Scoring him high in Lexington USDF 73.6%. He was breathtaking and very promising. We decided to keep Elijah at Hidden Promise with intentions of showing off Nico's offspring in the performance ring. Elijah as a 4 yr old was high point several shows (high score of 76.6) training level and campion 1st level horse At Dressage on the River in TN. Elijah was 4th in the Nation in the All Breeds Awards with the ATA and also placed 4th in the Region 1 Championships. Trainer Joni Abney has done a beautiful job with him and raves about his trainability, wonderful disposition and of course talent. They are ready to head out this year showing 2nd level. This was our first Quarter Horse cross on our farm. What a cross!!!!!! 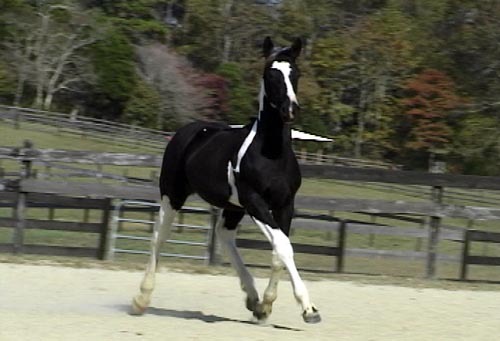 This is a very fun athletic fancy filly. Versatile and people-oriented. Must see her video....another one in the oven because we like her so much! To Alene Hutton ( Washington Equestrian Team) was married upon Tollie in her wedding! See photos. 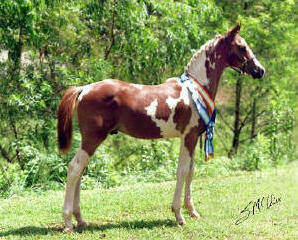 A leggy, flashy, strikingly marked filly. Carries herself beautifully with nice long strides. This filly had a very nicely bred TB dam that is a natural jumper. She has a lot of the TB traits.....just a little bigger boned and lots of animated movement and color. Kind eye, very pretty face and expression, feminine. This colt is a super athlete. Very intelligent and handsome. This is an all-round prospect. 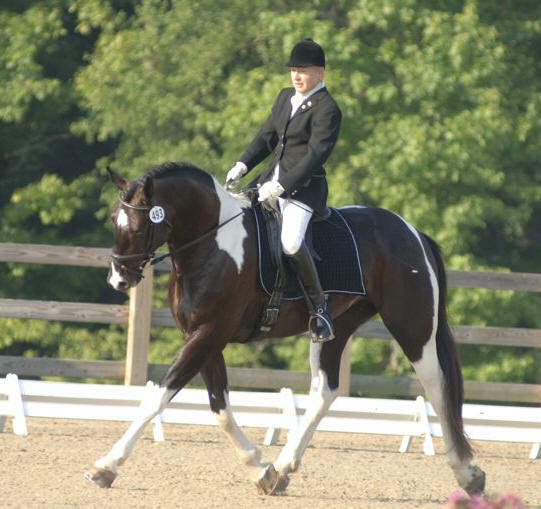 Excellent dressage movement yet athletic enough for a very competitive event horse as well. 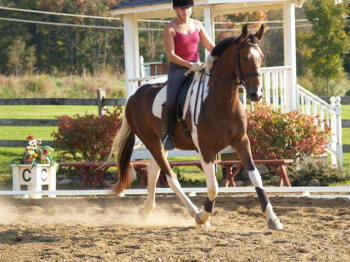 Big, big extended trot - very easy and natural for him. to Lynn Tezak having fun in Cleveland Ohio training in dressage and playing with cows team penning :)......great brain! I love this filly! 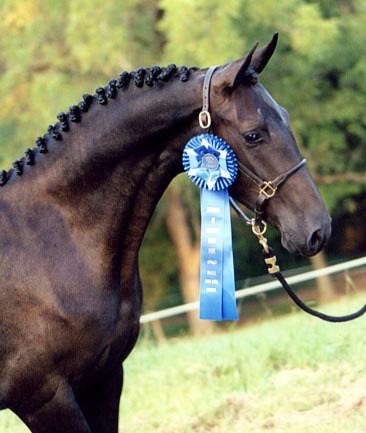 She just wowed everyone in Lexington, KY, at the MSEDA Breeders' Classic on Sept. 11, 2004. In a large and very impressive class of yearling fillies, Truth was High Score/First Place with a score of 74.5. The judge also gave many compliments on how lovely she is. She has such presence and is pretty as a picture with beautiful, fancy movement. With her power and elegance, she is a performance prospect for sure -- especially in dressage or eventing. This colt was sold in utero to Ann Rich in Ohio. She purchased foal from Tobruk Farm to resell him........then he went on to take Champion Colt and Reserve Champion young horse at a USDF show in Georgia. She is now not so anxious to sell but would consider the right buyer and situation. He has qualified to go to the Finals in Florida and will certainly prove to be an outstanding performance and show horse. A show stopper! Ann is also the proud owner of Solomon who is presently growing rapidly into a handsome performance horse which she intends to jump and train in dressage. Ann Rich of Ohio who bought Perfect Puzzle in-utero to resell finally let him go to a very excited new owner. 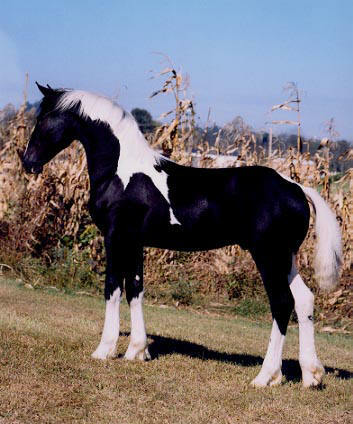 Puzzle was Champion colt and Reserve Champion young horse USDF in Georgia as a weanling. A Show stopper! to an ecstatic Jill Luna in California. We are thrilled he is so loved, thanks Jill! All photos copyrighted by Susan McAdoo. © Copyright to Hidden Promise Sporthorses. All Rights Reserved.